Super Hero Boy: Just look up! Is it just me or is the night sky getting harder and harder to see clearly? I remember as a child laying on my best friend's trampoline at night and feeling the stars almost engulf me. Feeling so tiny in such a big universe and wondering if anyone else was out there looking up as well. It seems these days unless you live in the middle of nowhere the congestion of all those street lights, city lights, and just plain the hustle and bustle of family life the stars are getting farther and farther away and even when you can see them your just too busy to notice. Well There is absolutely no reason why my son can't enjoy the night sky every single night. And though I don't think there is any substitution for seeing it in person and letting the night sky envelope you as it did when I would look up as a kid, I now have the perfect solution for all those other nights. 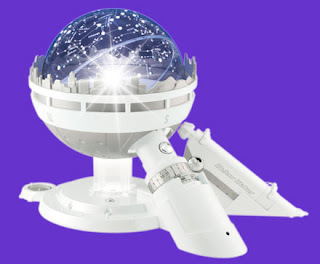 The Star Theater Se from Uncle Milton brings the night sky direction into your bedroom. The Star Theater looks a little like a globe on a base but when you turn it on it lights up and you can decide if you want to project constellations or stars onto the ceiling depending on which of the two globes included you use. I did a little bit of homework before I received the Star Theater Se and was surprised to see some complaints on the projections being blurry when you project them onto the ceiling. Well when the Star Theater arrived I too saw the same thing as I set the projector up on the floor, and then the bed, and then finally I figured it out. I placed the Star Theater on the top of Connor's dresser (the highest point in the room) and tada suddenly everything was suddenly in focus. We could read the names of the constellations, see the stars clearly and we were in business. If you think just having the stars projected on your ceiling is cool your in for a treat as the Star Theater does much more than that! Included with the Star Theater Se is several accessories which really adds to the learning value. The first is the Meteor Maker which is a light want that allows you to make your own meteors streak across your projected solar system. Also included is an audio cd that gives you a spoken tour of the night sky as well as a computer CD that gives you a more visual tour. You can also set the Star Theater to a specific time of year to see how the sky changes as the seasons do. My favorite feature especially while Connor is little is the fact that the Star Theater also works as night light. It has a separate blue light that projects from the bottom and though on the night light mode it does not really projected the stars it does look really cool. The constellation globe glows in the dark and the blue light makes it look like a blue glowing orb sitting on the shelf. Connor absolutely loves it as he is one of those babies that refuses to sleep unless his room is at least somewhat lit up and the blue glow is much more pleasing than a white night light. You can learn more about the Star Theater SE as well as purchase your own on the Uncle Milton website.